*We are currently taking reservations for the following dates in 2019: April 19-22. Before reserving your trip or to inquire about other dates (groups of 15 and more) contact us by phone or live chat during office hours. 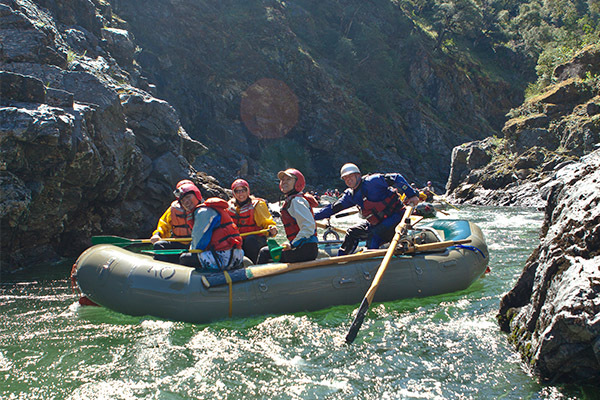 The California Salmon River is one of the best and most difficult spring whitewater rafting runs. Experienced rafters eagerly travel to the northern corner of the state for this river’s outstanding whitewater and temperate rainforest scenery. Your trip begins like a bullet with Class IV+ Bloomer Falls, The Maze, and Lewis Creek Falls coming in a rapid succession. The canyon walls constrict tightly as we descend into this National Wild & Scenic River canyon. As the morning ends, we break for lunch just before one of the most challenging Class V sections of the river. Last Chance and Freight Train rapids serve as a vivid reminder of the power of this awesome run. The final part of the day is spent on the lower section, where the river mellows some and allows for moments of relaxation and reflection. The itinerary above may be altered due to a range of variables, including river flow levels, time of year, and other factors. Contact us if you have any questions. The Cal Salmon ranks as one of the most difficult rivers in California. 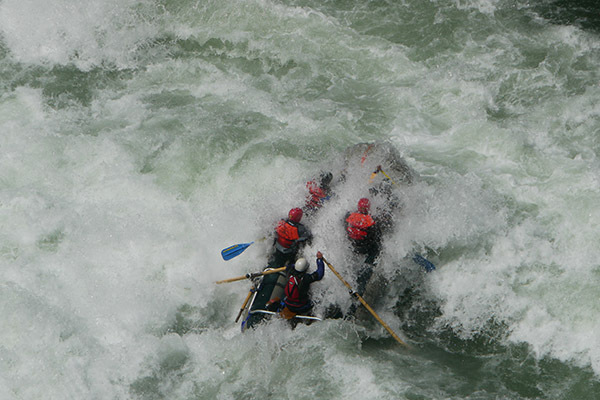 Rapids are steep, powerful, and often long. Water bounces off the narrow walls, careening downstream with intensity. In Class V Cascade rapid, you'll blast 15' down a tight chute of frothing whitewater. A few minutes later you'll come face to face with one of the river's biggest and longest challenges: boulder-strewn Class V Freight Train Rapid! At the end of this trip, you'll know you've accomplished something extraordinary. 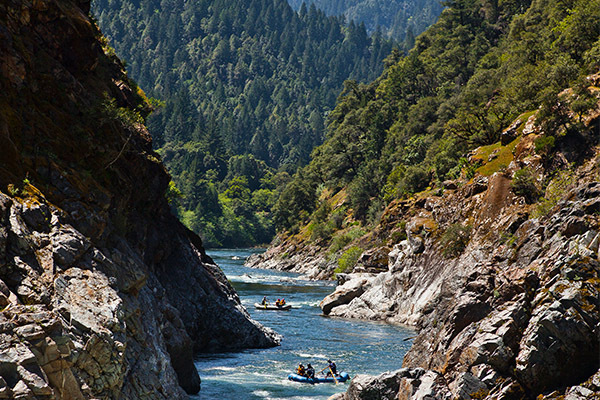 The Cal Salmon's steep and narrow canyon inspires as much awe as its whitewater. When you catch your breath between rapids your eyes will be greeted with lush foliage and waterfalls lilting from high cliffs on both sides of the river. The canyon's beauty is so stunning that it is protected by congress as a National Wild and Scenic River. 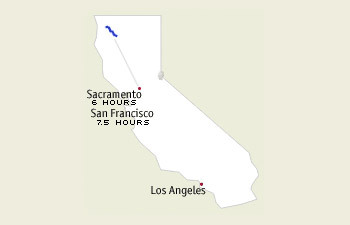 Six and a half hours from the San Francisco Bay Area, the Cal Salmon is near the California-Oregon border. Highway 96 is the closest thoroughfare. The Cal Salmon is a free-flowing river. With no upstream dams, the river depends on snowmelt for its flows. The Cal Salmon begins to run when the snow begins to melt in the mountains. Flows generally peak around Memorial Day. In most years we concentrate bookings into one weekend trip in late April. Later trips are possible for large groups, depending on flows and availability. * Season length and flows may vary. For this year's flow predictions and real-time water levels go to the River Flows page. 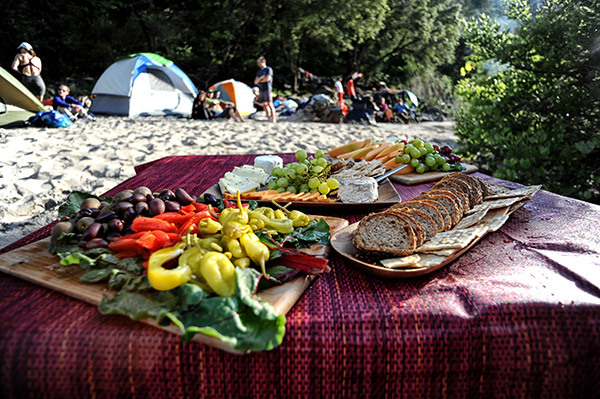 Our lunch begins with tortilla chips, salsa, and fresh summer fruits. Our gourmet "build-your-own" sandwich bar includes all the fixings needed to assemble the perfect sandwich to your preference. We also provide a beverage, and cookies to finish it off. If you have special dietary requirements, we encourage you to tell us at the time of your reservation. We will do our very best to accommodate your needs. Due to the difficulty of the upper section of this run, All-Outdoors usually runs oar-paddle combination rafts on the Cal Salmon. This effective combination of a guide with oars calling out commands to aggressive paddlers is the best way to enjoy Class V whitewater. When water levels on the upper section are lower, paddle rafts (both guides and guests navigate with paddles only) are sometimes an option. 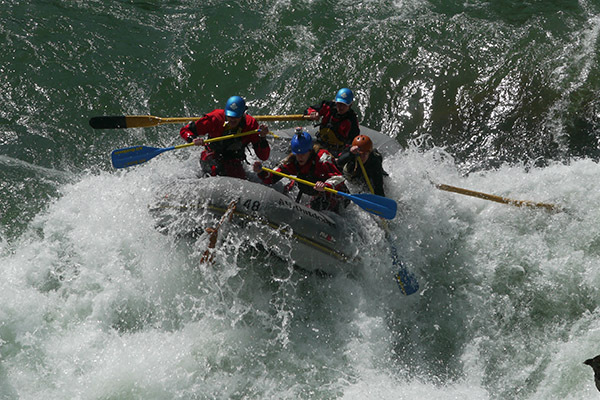 On the lower section, we often use paddle rafts. All guests should be able to swim. "This trip is definitely worth the extra effort and time to get to put in. The All-Outdoors crew is fantastic taking care of every detail and providing top flight hospitality. If you like big waves, fast, challenging rapids, and incredible scenery, this is the trip for you. It is a must on my calendar."